Iron Filters that remove iron, sulfur and manganese from well water. Iron in water? Rust in your well water? No worries. Sulfur, Manganese, Chlorine, Dirt, Chemicals, Sediment, foul smells and it tastes really great! Our Terminox® ISM backwashing iron filters are all purpose chemical free, salt free and maintenance free well water iron filter systems. They are great for the DIY Homeowner or ANY handy person. Or you can have it professionally installed. And while we carry EVERY kind of iron filtration system you can imagine, our Terminox® ISM is the most popular by far. 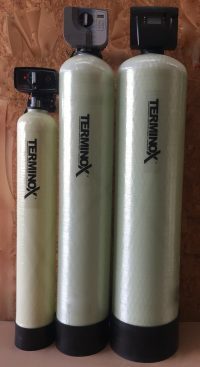 Because the Terminox® ISM removes iron, rust, sulfur, manganese, dirt, turbidity, tastes, odors and even chlorine. So it is the most advanced well water filter ever designed and sold exclusively by Water Filters of America™. No harsh chemicals, no salt and nothing to add or replace. You just "set it and forget it". Compare to iron filters that cost three times as much or more. And remember that we use only the finest national name brand parts on everything we sell. This iron, sulfur and manganese conditioner is our most popular whole house iron removal water filter. It has a much better water filtration ability than birm iron filters or air injection and pump types. We sell almost any type of iron filter and well water filter you can imagine, but Terminox® ISM is the best of them all. Please let our friendly experts help you decide the right filter for you. Don't worry, our techs will never ask you to buy anything and they do not work on commission. They are simply there to give you great advice and be nice. We also offer you lifetime support. This help is available 7 days a week including Sundays and most holidays. With our expert support you should never have to pay for a costly service call. BEWARE of "Slicksters" and "snake oil salesmen" trying to sell water softeners as iron filters. Because you should never use a water softener as an iron filter. How do I know what iron filters are right? *Maintenance FREE: No salt, chemicals or air injection like the old style backwashing filters. It's fully automatic. Just set it and forget it. *Hard Programmed: No need for back-up batteries. You can unplug one of these units for 6 months and it stays programmed. Because it is the very latest American Made technology. So it is great for seasonal homes and cabins too. *Easy Install: Our optional "easy install" quick connect systems for iron filters mean that they can be "plumbed in" minutes. No special tools or plumbing skills needed normally. Great for the Do-It-Yourself homeowner, or anyone who is handy at all. *NSF Approved: So you know you are getting the very finest equipment that has been officially approved for drinking level quality water. Because we sell only the finest National Name Brand Components in every unit we make and manufacture. We are not a middleman, or reseller or aftermarket brand. And we make every system we sell from scratch for exactly the kind of water you have. Compare these premium quality iron filters to what other companies sell for thousands of dollars. And those filters are usually the old green sand filters, or birm filters, or air injector filters, or mixed mineral bed slick willy filters etc. We sell every kind of filter there is. No other filter marketed in the United States today is as versatile or is as maintenance free and powerful as our Terminox® ISM iron filters... at ANY price. Period. Regardless of the sales pitches and the "dog and pony shows". Our Terminox 12' and Terminox 13" models are now the most popular maintenance free iron removal systems for residential and commercial water sprinkler and irrigation systems in the United States. Stops harmful staining of driveways, sidewalks, siding, pavers etc. No salt, chemicals or maintenance! There is never an additional charge to have our iron filters custom-made for exactly the type of water you have. Just call and speak with the friendly tech at 800-684-0979. Our friendly water techs do not work on commission and are not allowed to ask you to buy anything, or pressure you in anyway. They just answer all of your questions and give you great advice. So give us a call now. 7" Low Flow 7076BT $549.87 Buy Now! 8" Med Flow 7078BT $688.87 Buy Now! 9" Med Flow 7081BT $788.87 Buy Now! 10" Hi Flow 7082BT $829.87 Buy Now! PLEASE NOTE: Iron Filters pictured are not always what you receive. Because we custom make each unit from scratch for exactly the water issues you have. There are a number of different control valves, tanks and options that are decided upon by our engineering staff on each order. We make sure it is made for exactly the kind of water you have. Because each well is unique in our opinion. This assures you have the best equipment, at the best price, that does the best job, with the best warranties. We have everything. If there is some piece of specific water filter equipment you want, just tell us what it is. Note: Remember that all good iron filters should have water of at least 7.5 pH or higher to work properly. Some, such as Birm Filters, often need a pH of at least 8.0. ALL oxidizing filters need at least a pH of 7.5 or higher. And the good news is that if your pH is lower than that, it is usually fairly easy and inexpensive to correct. Be wary of anyone who says their iron filter is good below that pH. Because there are almost always serious drawbacks with lower pH water when using iron filters. Please do not hesitate to contact a friendly tech for a discussion of pH and iron filters. Manganese Greensand Filters are some times good for really low flow rates, but are rarely the best iron filters. Because the reason we normally try to stay away from these for home use, is that they use a strong chemical called potassium permanganate. We try to keep our customers from the need to use harsh or poisonous chemicals. So be sure you have spoken with one of our experts before you buy one. Click here to view our complete line of Greensand Filter sizes and prices. Birm Filters do not require chemicals, but DO require air injection and a much higher pH in most cases. Most people don't realize that a brim iron filter should normally have a pH of 8.0 or higher for proper operation. More so if you are certain you have BOTH iron and manganese in your water. So be sure you talk with one of our experts before you buy one. Click here to view our complete line of Birm Filter sizes and prices. Pyrolox Filter Systems also do not require chemicals for regeneration or air injection. And we were the online originators of Pyrolox back in the late 1990s. In fact, We know more about Pyrolox Iron Filters than anyone. Because we were the first to offer them. And we still sell them as a lower priced option to our Premium Filter (Terminox®). So Pyrolox used to be our main line of iron filter many years ago, before we developed the far superior Terminox® ISM. And we designed the Terminox® to solve the issues we had over time with the Pyrolox Filters. In addition, it is good to know that Pyrolox usually works fairly well if you only have one issue or contaminant, such as iron. But if you have 2 or more contaminants, such as iron and sulfur. Or iron and sulfur and manganese. The smart choice is Terminox® in those situations. But Pyrolox does not seem to work as well if you have more than one water issue. And NEVER buy a Pyrolox with "zeolite". That is just a filler that mimics water softener resin. It actually makes iron stick to it, and then it can't remove it. Eventually minerals treated this way will become "Iron bound". That requires expensive service calls to replace. Also watch out for people using greensand PLUS as a Pyrolox additive, or using greensand PLUS all by itself. Greensand PLUS is exactly what it implies in this regard. It is simply SAND. They take a bit of oxidizing mineral, similar too Pyrolox and coat the outside of the sand with it. It works great at first and then it begins to fail over time. After a bit, all you have is cheap sand left over. It costs nothing to make, but they sell it as though it is as good as Pyrolox. It is not. And Pyrolox is not as good as Terminox®. And this is a problem for all Pyrolox units offered by all companies. For example if you have iron, sulfur and manganese, the Pyrolox can get overwhelmed. Also, it may need to be re-bedded every few years. The Terminox® ISM was designed to work with multiple issues and should last for many years when set up right. Also the Pyrolox is far more sensitive to low pH problems. Low pH can harm the mineral in a very short time and cause it to need to be replaced. Be sure you have spoken with one of our expert techs before you buy one. Please click here to view our complete line of Pyrolox Filter sizes and prices. Acid Neutralizer Systems can sometimes assist iron filters when the pH is too low. And they operate by passing acidic, or low pH water through either Calcite and/or Calcite Plus minerals to raise the pH. Also, Some acid neutralizers correct pH by squirting a mixture of water and soda ash into your water line. And these are called chemical feeders. Be careful of people who suggest you use any type of acid neutralizer to remove iron. So remember that you should never use minerals that raise pH inside of an iron filter or sulfur filter. Because they can make the iron filters' mineral bed unstable. This is another reason we call this a "Slick Willy" tactic. Because it is designed to create service calls for that dealer. So be sure you have spoken with one of our techs before you buy one of those. And you can click here to view our Acid Neutralizer sizes and prices. Iron Bacteria can cause problems for your new iron filter. So check to see if you have iron bacteria. Also, you can find instructions to do a simple home check for iron bacteria by clicking here. Chemical Feeder Systems are often called chlorine injection systems too. Because our feeders will do both chlorine disinfection of well water and pH increasing. And they are the most common way to control iron bacteria, and most low pH issues when used with a Terminox® ISM filter. So be sure to speak with one of our techs before you buy a chemical feed system. And you can just click here to view our complete line of Chemical Feeder Systems sizes and prices. In Line Filters are removable cartridge filters that you can use to remove sediment or small amounts of red water iron or rust. So click here to view our complete line of In-Line Cartridge Water Filters sizes and prices. So just remember that the big jobs to remove larger amounts of iron should be removed with a backwashing iron filter such as the Terminox® ISM. And just be sure to speak with one of our friendly techs before you buy an iron filter. Your iron filter can remove iron from water as well as sulfur, manganese, turbidity, chlorine, dirt, tastes, odors and many other contaminants from the entire home or house. And our most popular iron removal system is Terminox® ISM. Because these whole house iron filtration systems are of the highest quality and designed to last many years. Also, when removing iron from water, be sure to ask for advice from our well water technicians before you buy your new iron filter. And remember that iron and water don't belong together. Certainly no one wants iron in their home's drinking water. So with our new Terminox® ISM Filter you have no reason to put up with well water iron at all. Let us take your iron out. Remember that any pH below 7.0 can damage any iron filtration equipment. And most effective iron filters require an even higher pH. All oxidizing filters require a minimum of 7.5 pH. So you should contact our tech support staff before buying your new iron filter. Also, please keep in mind that rust filtration systems and iron filtering systems are the same thing. And if you need advice on rusty water problems, just give one of our experts a call for friendly advice on selecting iron filters. And remember that our water testing of rust water or iron water is always free. Give us a call now at 1-800-684-0979. The call is free.